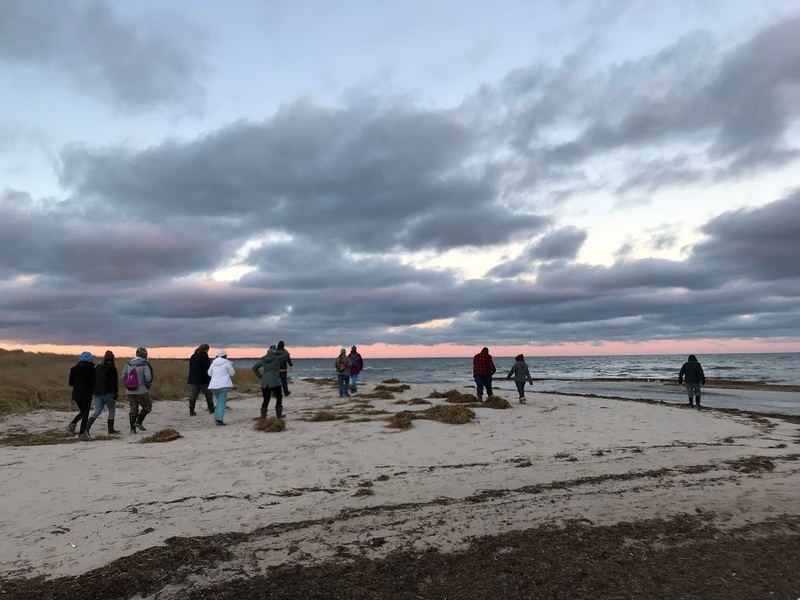 When my biology professor announced that the class had a weekend trip dedicated to rescuing cold-stunned sea turtles in Wellfleet, we were thrilled! We discussed six papers, and read more than twenty about the physical and biological factors of cold-stunning to prepare for the trip. But reading these papers could never have prepared me for the breathtaking feeling of rescuing sea turtles in real life. The first thing that Unity College tells its new students during convocation is that we are going to make a difference. Attending a school that focuses on being environmentally conscious and encourages experiential learning inspires a future focused on protecting the blue planet. But sea turtles are charismatic megafauna.They are the celebrities of National Geographic and often serve as a poster child for plastics pollution mitigation. When you live in New England, you never think you are going to see those tropical species in person. Mass Audubon gave us that opportunity. 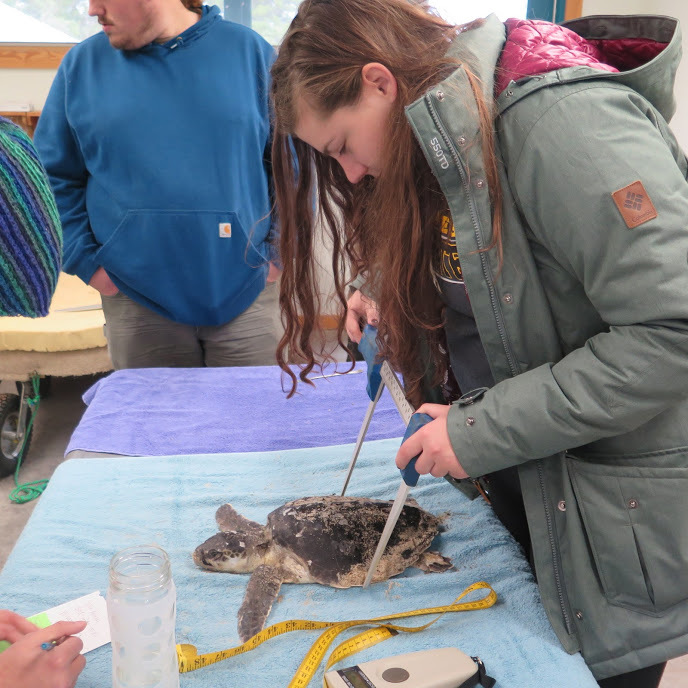 After a five-hour drive from Maine on a Friday afternoon, and being up even later for preparatory lectures on cold-stunned turtle procedures, you would think a 5:00 a.m. wake-up call would produce groggy young adults. But the last thing you could see in our eyes was regret. Everyone was cheerfully stuffing hand warmers into their gloves and socks to get ready for the surveys ahead. Unity students walk the high tide line and watch the water’s edge for stranded sea turtles. After two hours of marching through the sand, we were disappointed we didn’t find anything. 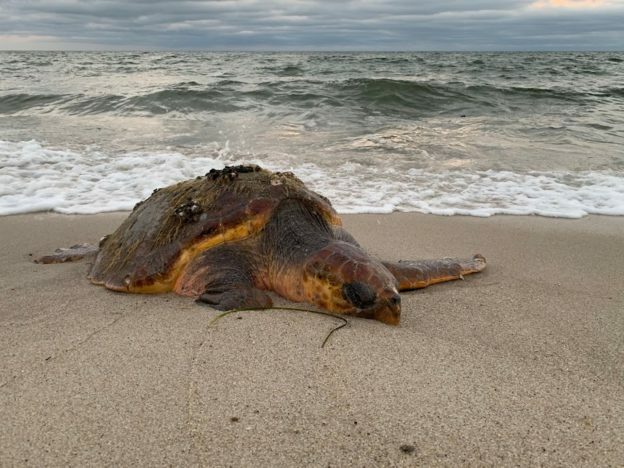 I felt sorry for turtles that couldn’t make it to shore, and were instead freezing in the bay. As we were gearing up to head back to the Wellfleet Bay Wildlife Sanctuary, our guide, Bob Prescott, received a call about a sea turtle found in Brewster. It’s always good to have a group on the beach to rescue a loggerhead. He asked us if we had room in one of our vans for a 90 pound loggerhead. We guaranteed that we had plenty of room! Putting advance preparation into action! 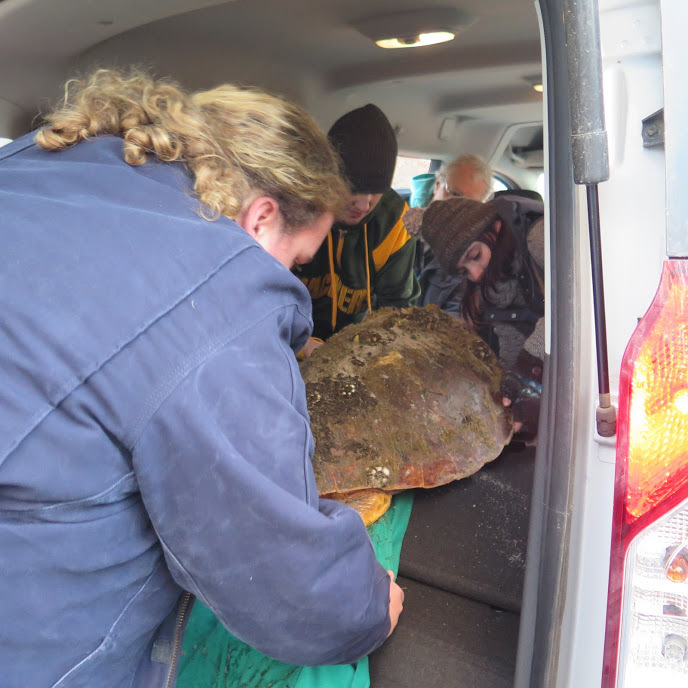 Like wildlife paramedics we loaded the lethargic turtle into our trunk and carefully remembered our brief training. Loading the turtle. Fifty-five degrees. Carapace upright. Flippers comfortable. Be quiet. Is this happening? I was scared to drive because I kept thinking that if we hit a pothole, the turtle would die, and I’d go to jail for killing a member of an endangered species! Bay staff. Photo by Cheryl Frederick. 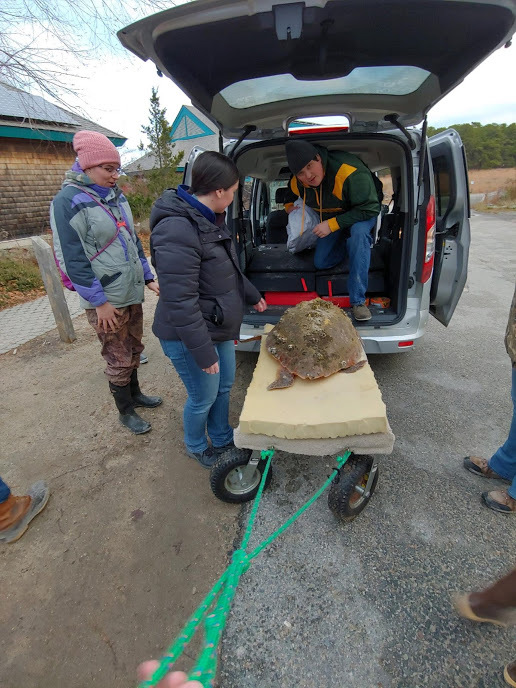 But we made it to Wellfleet Bay and with the staff’s help, were able to process it and measure its straight and curved carapace lengths, widths, and weight. Large calipers are used to get straight line measurements for a turtle. 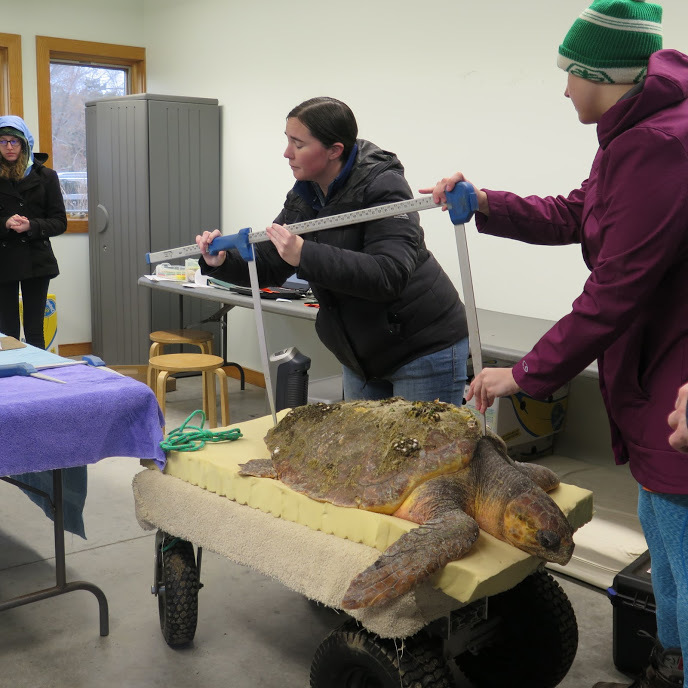 Then, the loggerhead was ready to take its next step towards rehabilitation in Quincy at the New England Aquarium. Smaller calipers for smaller turtles. We were able to process a few Kemp’s ridley sea turtles that had been brought to the sanctuary, observe a professional Kemp’s ridley necropsy, and do another beach survey. But nothing compared to that first feeling of rescuing a sea turtle for the first time. Upon reflection, I am forever grateful to Wellfleet Audubon and Unity College for providing this rare opportunity to interact with marine life. It made me feel like an educated biologist-in-training and am so glad I’m able to spread the mission of protecting biodiversity. Thank you, Wellfleet Bay! This blog post was contributed by Jordan Baker, a marine biology major at Unity College in Unity, Maine. This entry was posted in Updates on December 18, 2018 by Wellfleet Bay. Nice story Jordan. I leave near Rookery Bay Preserve in Naples, Fl. They are always looking for interns for their turtle and other ocean projects. Keep up your good and caring work. You will make a difference! CJ..
what a great story, good work students!